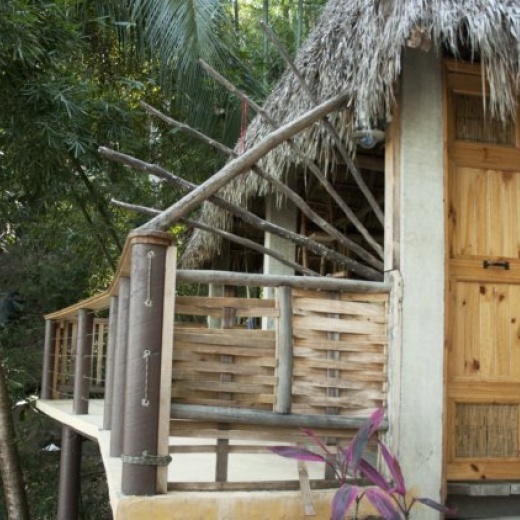 Sometimes called “the Cone” because of its conical shape, Casa Banana can be a hostel-style casa, offering a more communal experience for your Mexican beach vacation in Yelapa or you can rent the whole Banana as a private casa. Either way, whether you can rent one of the single beds in a hostel-style shared space or the entire casa all by yourself, Casa Banana has appeal. 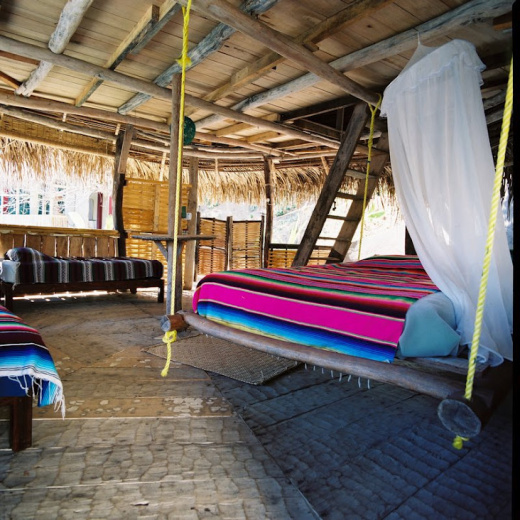 The two story palapa features one queen-sized hanging bed and two twin beds on the first level, two or three twins beds can be used upstairs. Casa Banana is named for the many banana trees planted around the boundary. El Jardin Eco Retreat is nestled between the ocean and the jungle, on a small cove on the southern edge of Banderas Bay on Mexico’s Pacific Coast. El Jardin is a 10-minute walk from the pueblo of Yelapa, and a short boat-ride away from the bustling city of Puerto Vallarta. El Jardin consists of a large kitchen and living areas, surrounded by open-air palapas for sleeping and personal space. Every spot on the property allows for stunning ocean views and easy observation of the seaside jungle. In addition to the units for our on-site owners and staff, we offer four open-air palapas for short- and long-term rentals. Guests can chose to rent a single bed, a complete unit, or the entire property. El Jardin is perfect for individual stays, group retreats, family reunions, weddings, conferences or other events at an affordable price. Spaces are quite versatile and can be arranged to accommodate everything from a quiet yoga studio to a boisterous dance session. As a guest of El Jardin, you are welcome to start your day with complementary coffee and teas (from November to May). Breakfast service is available upon request. Guests may use the kitchen on site with prior arrangements through the on-site owner/manager. We can also arrange to have a great local cook prepare a full suite of wonderful meals for you upon request.